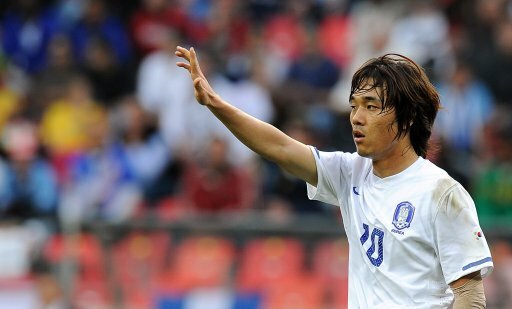 CHELSEA have opened talks with South Korean star Chu-Young Park over an £8 million move to Stamford Bridge. The 25-year-old forward, who currently plays his club football in France with AS Monaco, met with Chelsea manager Carlo Ancelotti, sporting director Frank Arnesen and chief executive Ron Gourlay hours before their opening-day drubbing of West Brom to discuss a deal. It is now thought that the Premier League champions have 48 hours to officially lodge their interest (i.e. make an offer) with the Ligue 1 side. Chu-Young ‘shirt sales’ Park is a huge star in his homeland, second only to Manchester United midfielder Ji-Sung Park, and it is thought that Chelsea may use the signing of the forward to boost their standing in the potentially lucrative far Eastern market – which is dismally cynical reasoning in anyone’s book. Chelsea are also thought to be wary of the fact that by signing Park, club sponsors Samsung (who are a South Korean company) would be encouraged to extend their deal which currently expires in 2013. Lovely. Why not sign Lee Chung-Yong from Bolton.. I agree that lee ching yong is better but bolton’s asking price will be higher than park’s considering that lee Is their best player. One of my favs. This guy totally dominates the killer pass. incoming movement from the sides and he will deliver that ball perfectly. Why are you talking about Lee Chung-yong (who is of undeniable quality).. He’s a wing forward while Chuyoung is a striker/number 10 position. its always some crap about the asian market as if when one korean guy makes it to chelsea china,japan,korea etc is gonna start buying chelsea jerseys in bulk. its absolutely ridiculous. this guys talent is being overlooked.